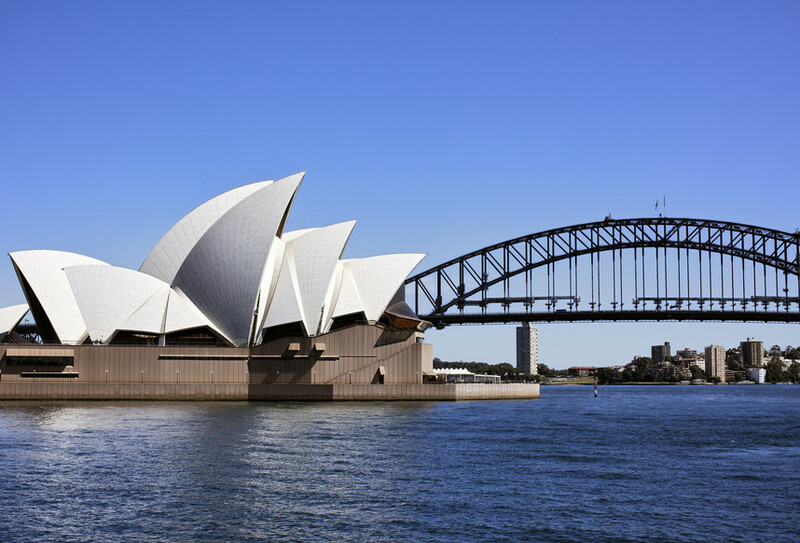 A surprise grounding of all Qantas flights on Saturday caused a nearly 48 hour disruption of service in Australia, Los Angeles, and elsewhere. Flights resumed after an Australian court ruled on the bitter labor dispute which prompted the walk-out. The Australian government called an emergency court hearing on Saturday night to end the work bans for the sake of the national economy. There had been no advance warning of the labor action. Qantas is the largest of Australia's four national domestic airlines, and the grounding affected 108 planes in 22 countries. About 70,000 passengers fly Qantas daily, and would-be fliers this weekend were stuck at home, hotels or airports, or even had to suddenly deplane when Qantas suspended operations. More than 60 flights were in the air at the time but continued to their destinations, and Qantas was paying for passengers to book other flights according to the airline. 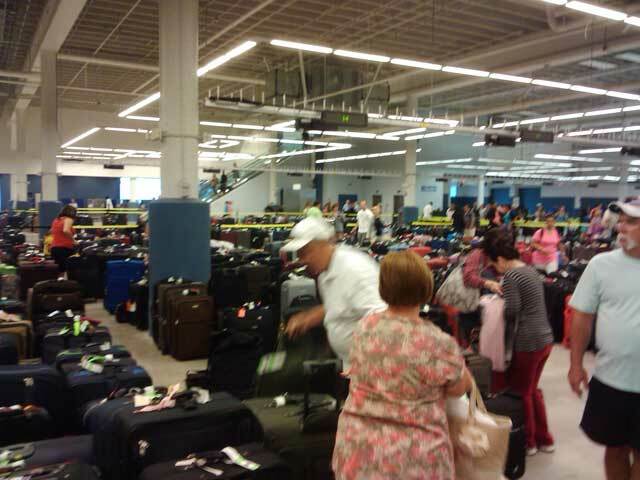 Royal Caribbean, Princess and Holland America all have ships sailing in the region and are evaluating the situation. Royal Caribbean's Radiance of the Seas is scheduled to sail from Perth, Australia, on Monday evening, meaning that many passengers are likely scrambling to make alternate travel arrangements. 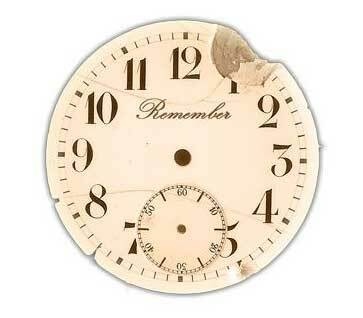 It will be 24 to 48 hours before Qantas returns to normal. See the following link for Latest information about resumption of scheduled Qantas services. This airline strike is unfortunately another example of an unexpected situation that can cause your vacation plans to go awry. We always highly recommend you purchase travel insurance for these unexpected events. We want you to have a worry free vacation, so the small cost of the insurance should be reason enough for peace of mind. The priceless component is that there is someone you can turn to should an emergency situation occur. This weekend alone, insurance companies, like Travel Guard, were helping stranded passengers due to Tropical Storm Rina, the snowstorms on the East Coast, and this Qantas strike. And those are only the ones that made front page news. The most common excuse I hear for not purchasing insurance is "I don't need it, I plan to go no matter what." As you can see from these examples, you aren't always in control. 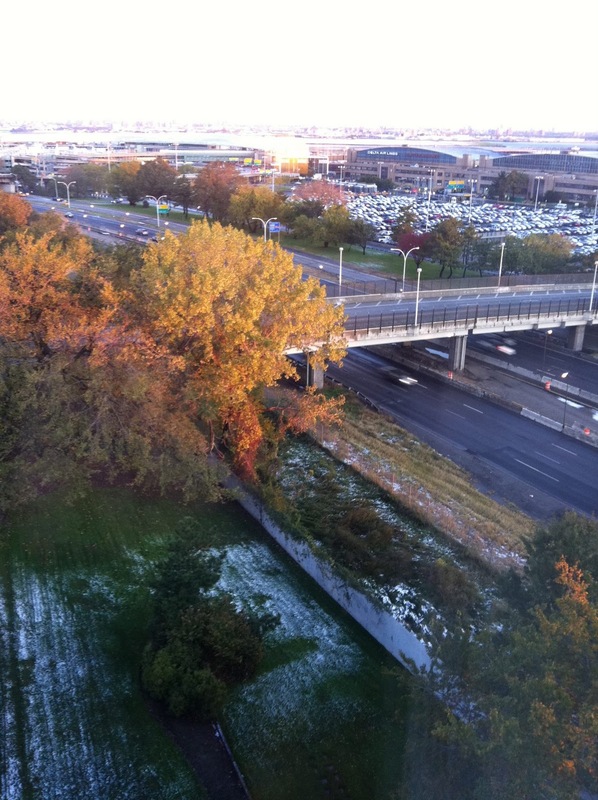 Passengers arriving from MSC Poesia's 7-Night Canada & New England cruise were greeted by a historic October snowstorm. The Nor'easter dumped record amounts of snow from New Jersey through New York, Connecticut and Massachusetts. More than 2 million homes and businesses were without power as a result of the storm and at least three people died from storm-related causes. 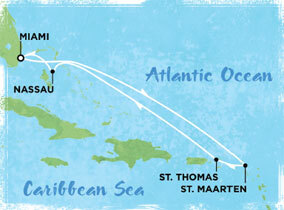 With one month remaining in the 2011 Hurricane Season, one might expect cruises to be impacted by tropical storms. Mother Nature had something else in mind for this last weekend of October. Flights were cancelled or delayed for hours at all major airports on the East Coast. That meant that anyone traveling home from a cruise that docked in the East Coast or planning on leaving from one, probably had a weather related event to deal with. Travel agents attending the 2011 NACTA Convention on MSC Poesia were among those impacted by the flight cancellations. Our friend, Joan, was among them as she attempted to get home from the convention. Realizing that it wasn't going to happen on Saturday, she booked a local hotel and headed there to make the best of things. Today she headed to LGA airport again only to find another delay. This time the delay was due to unavailability of crew. Finally a second pilot showed up and everyone cheered. Passengers were able to board shortly after that. Stories like these happen all the time. Passengers on their way home from cruises, that ended in the East Coast Saturday, had to find local hotels, if they could get them, and make alternative flights home. That meant unexpected out of pocket expenses for food, hotel, transportation, etc. For those on the way to cruises, the expense, logistics, and impact on vacation plans perhaps was much greater. In both those situations, you don't have to be alone. With the purchase of Travel Insurance, such as Travel Guard Companion that we offer our clients, there is a professional staff at your disposal to help make the emergency travel arrangements. We are watching a developing tropical storm in the Caribbean Sea which is forecast to strengthen over the next few days. Heavy rainfall is predicted over the Cayman Islands. Carnival Freedom: The ship departed Fort Lauderdale on Sunday for a six-night cruise. Instead of calling at Grand Cayman on Wednesday and Ocho Rios on Thursday, the ship instead visited Montego Bay yesterday, with a sea day today followed by a call in Key West tomorrow. Carnival Imagination: The ship departed Miami on Monday for a four-night cruise. Instead of calling in Key West Tuesday and Cozumel Wednesday, the ship sailed for the Bahamas, with an overnight in Nassau on Tuesday and a visit to Freeport on Thursday. 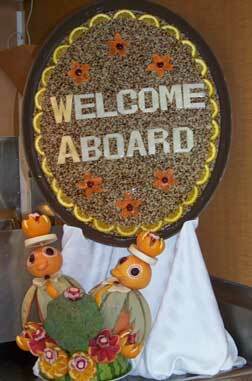 Carnival Inspiration: The ship departed Tampa on Monday for a five-night cruise. Instead of calling in Grand Cayman Wednesday and Cozumel Thursday, the ship overnighted in Cozumel on Wednesday for a two-day call. Carnival Ecstasy: The ship departed New Orleans on Monday for a five-night cruise. The planned call on Progreso on Wednesday was replaced with a sea day. Carnival Conquest: The ship departed Galveston on Sunday for a seven-night cruise. The planned call on Grand Cayman today was replaced with a sea day. Royal Caribbean's Freedom of the Seas was also forced to miss Grand Cayman today and spent the day at sea instead. NCL's Norwegian Pearl did call in Grand Cayman, an NCL spokeswoman told us, but instead of tendering to Georgetown, the ship was sent to Spotts Bay on the south side of the island. OF 1 TO 3 INCHES ARE POSSIBLE OVER THE CAYMAN ISLANDS. There are special offers throughout the month. The highlight of the month is this week, October 17-23, 2011 which is designated the National Cruise Vacation Week (NCVW). We have a special page (click here) which lists the offers and other information. personally assist you to make your dreams come true. It is the wee hours of the morning and Allure of the Seas has pulled into Port Everglades, its home port in Ft. Lauderdale, Florida. There is much to do in preparation for arrival in Ft. Lauderdale. The ship arrives between 5:30 AM and 6:00 AM and shortly thereafter begins the process of turnaround. The U.S. Customs officials must clear the ship before anything or anyone is allowed to disembark. This process on the Allure of the Seas went by without anyone even noticing as they were having their final breakfast onboard the ship. Just like on most ships, disembarkation is done based on color-coded numbered luggage tags. There is an option for early walk-off, without assistance, for those that can manage their own luggage and want to get an early start. The remainder of the luggage tags are assigned based on information provided to guest services regarding your travel plans. Guests traveling on post-cruise shore excursions and elite Crown & Anchor members are among the first that may disembark the ship. When completing the disembarkation form, guests provide details about the flight arrangements which factors into the luggage tag assignment. We had a flight at 11:30 AM from Ft. Lauderdale International Airport, so our tags were #14. 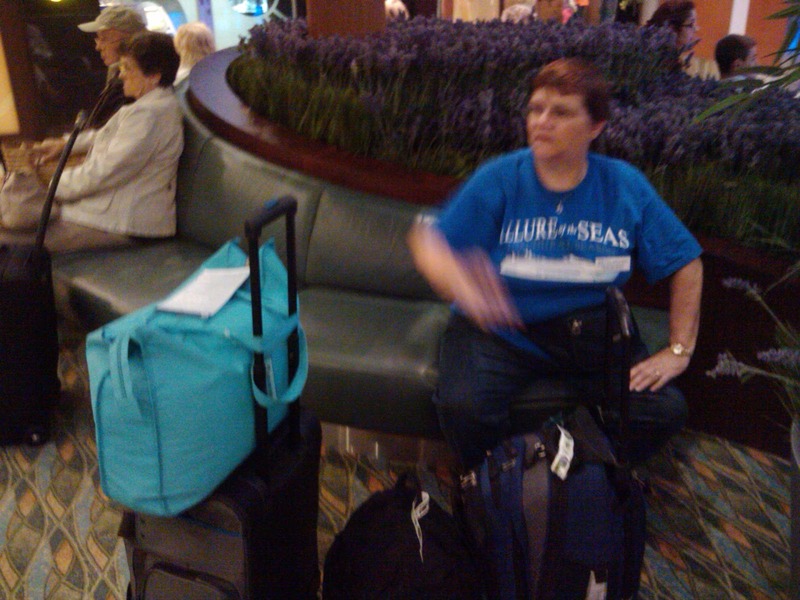 Since we knew approximately when our number would be called, we had proceeded to some benches near the gangway. We monitored the electronic screen to see when our number was called. 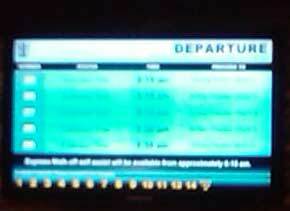 According to the time on the screen, our number was called around 7:35 AM, but we took our time disembarking. Once off the ship, we proceeded to the customs luggage hall where all the bags were lined up by tag number. It's amazing to think that the ship only docked 90 minutes ago and all this luggage was already in place and ready to be picked up. We found our bags right away and headed towards the U.S. Customs counter where our passports were checked and our declaration form collected. Taxi cabs can be found straight ahead and other transportation, such as tours and Royal Caribbean transfers are to the right as you exit Customs. We found disembarkation to be a very efficient process !! We were in a cab and on our way to the airport by 8:10 AM, plenty of time to check-in at the airport and go through security before heading to our gate. Well, if you are like us, you probably got to the pier around mid-day so the cabins aren't ready for occupancy yet. We had a light breakfast at the hotel because we knew that once we got onboard, there would be several venues open for us to grab a snack. The gangway of Allure of the Seas is on Deck 5 which is the Royal Promenade. 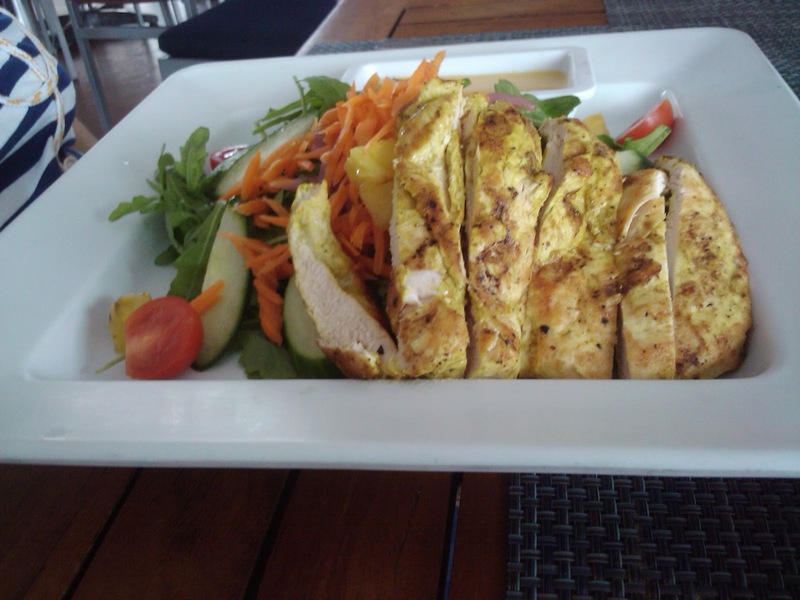 Here you'll find Sorrento's and Cafe Promenade which have extended hours and offer snacks. A slice of pizza at Sorrento's was our choice for something quick. After pizza we stayed awhile people watching, one of our favorite things to do onboard the ship. For those that like to drink Coca Cola products with their meals or while lounging by the pool, you may want to consider purchasing the "Coke Fountain Sticker" which entitles you to as many fountain drinks as you like throughout the cruise. The cost is $6.90 per person per day plus tip and includes a limited edition Royal Caribbean Coke bottle which can be refilled at any bar or restaurant on the ship or on Labadee, the private island. These can be purchased on the first day of the cruise on the Royal Promenade. We stopped for a sausage at Boardwalk Dog House before heading to our cabin. Passengers were getting their first glimpse of all that the Allure of the Seas has to offer on the Boardwalk. Go for a ride on the carrousel or enjoy some refreshments in one of the dining venues. We would reassemble here before we sailed for the mandatory safety drill. It is not necessary to bring life jackets with you to the drill. In a real emergency, life jackets would be provided by the crew at the muster stations. First in a series of articles about our 7 Night Eastern Caribbean Cruise on Allure of the Seas. 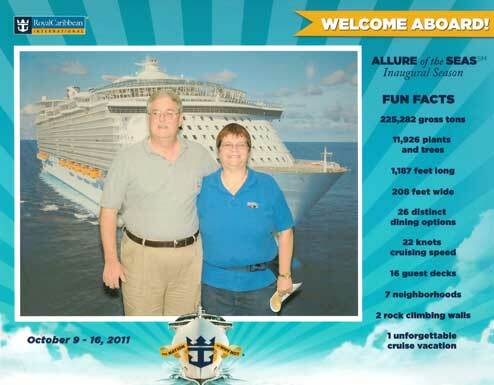 Virtually tour with us as we explore the Allure of the Seas and all she has to offer. We'll highlight some of our adventures on land and sea during the week. Waking early Sunday morning, we went out on our hotel balcony to see the Allure of the Seas and Emerald Princess completing their docking maneuvers. 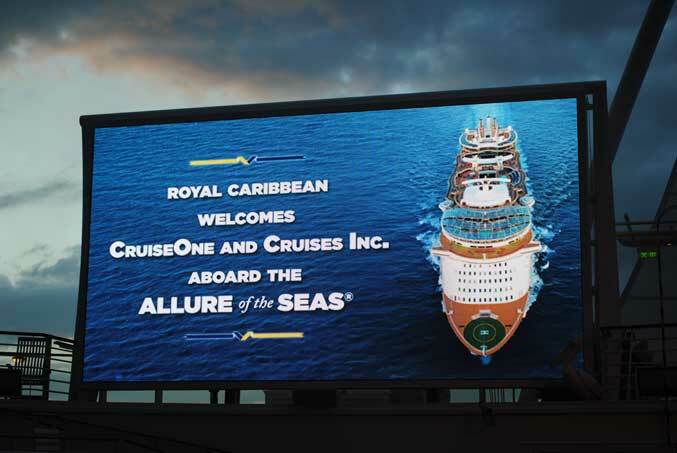 Soon we would be onboard the Allure for our National Conference cruise. We left the Hyatt Ft. Lauderdale hotel around 10:45 AM with another agent couple. After returning their rental car, the shuttle took all of us to Pier 66, which is within sight of the hotel. We had to wait while for the shuttle, so we got to the pier around 11:30 AM. By noon we were onboard the ship. Most of you are aware that Allure of the Seas is the largest cruise ship in the world at present. She and her sister ship, Oasis of the Seas, are the latest ships in Royal Caribbean International's fleet. Allure is coming up on her one year anniversary, while Oasis celebrates her second birthday this year. Fully loaded, these ships accommodate around 6,000 passengers. 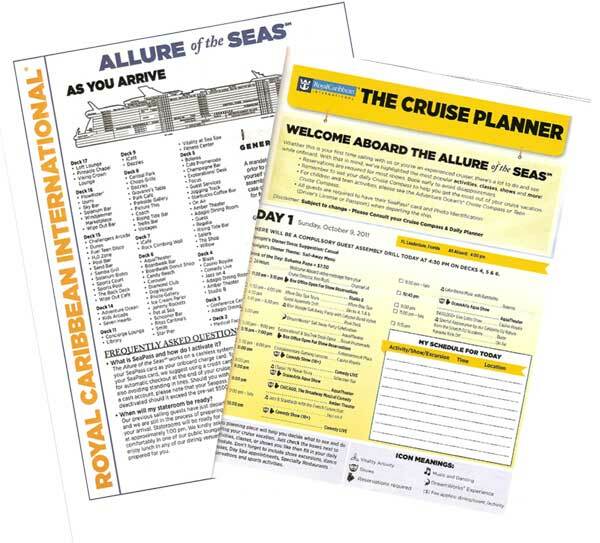 Allure sailed at full capacity for our sailing. The amazing thing is that Royal Caribbean guarantees that you won't have a long wait for embarkation. 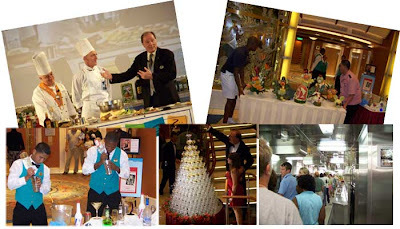 This was our second cruise on Allure, and they delivered on their promise both times. We are Diamond members, which means there would be a special line for us at embarkation, but we didn't even need to go in that line. After passing through security, we headed to the check-in lines where we were directed to a gentleman holding up his sign indicating that he was open and waiting for guests. The embarkation stations are grouped by deck making for a very efficient process. After giving the check-in agent our completed paperwork, showing our passports, providing the credit card for onboard purchases, and having our picture taken for our cabin keys, we were off for our first photo opportunity, the Welcome Aboard photo. He had given us our cabin keys, The Cruise Planner (pictured above), and a fold-up pocket guide map of the ship. 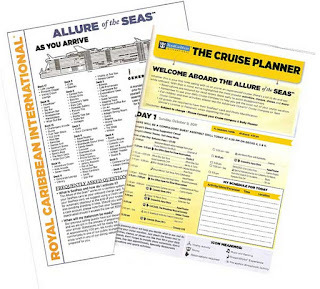 These can be very useful throughout the ship, but if you read our past article, Navigating the Allure of the Seas, you'll discover that there are more efficient ways to find your way around. After our photo, we gathered our carry-on bags and headed to the gangway. 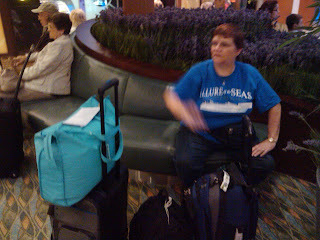 We showed our cabin key several times, including having it scanned, and then we were headed up the gangway to the Allure's entrance. At the top of the gangway, it's time to sanitize your hands and step aboard the ship. Cabins weren't ready for occupancy, so it was time to explore the open public areas. As we have mentioned in the past, whenever possible we prefer to arrive in our cruise departure port on the previous day. This way we can enjoy the start of our vacation, even if something were to go wrong, such as a flight delay. 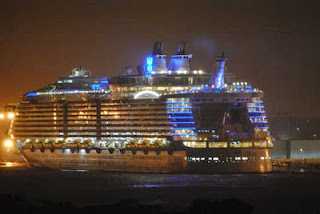 Our 2011 National Conference Cruise is on Allure of the Seas which departs from Ft. Lauderdale, FL. We bookedd a hotel room at the Hyatt Ft. Lauderdale which is just across from Pier 66, where Allure departs from. Since there was a pre-cruise cocktail part planned, we booked flights that would get us in mid-day. The down side of that meant we had to get up early to drop off the car near the airport and catch our fight. The parking lot shuttle dropped us off at the terminal and we proceeded to check our bags and then go through security. The line was long, but once it got moving, it went pretty quickly. Our gate wasn't far from the security checkpoint, so we still had time before the plane was scheduled to board. After purchasing a couple bottles of water, we waited in the gate area for the boarding announcements. hecking in. The flight took off on time and was smooth most of the way to Florida. The skies were overcast as we approached Ft. Lauderdale and in fact, it had been raining. The captain had the flight crew prepare the cabin early for landing since some turbulenced was expected. As predicted, it got a little bumpy as we approached, but all and all, it was a good flight. By the time we got to baggage claim, our bags were coming around the bend. We claimed our bags and headed to the taxi stand. 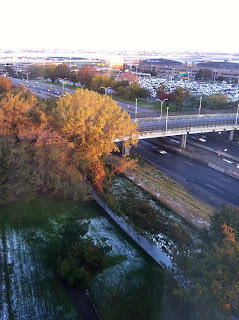 The Hyatt hotel isn't far from the airport, so within 30 minutes of landing, we were checking in at the hotel. The bellman brought our luggage to the room and we decided to go get some lunch. When we got in the lobby, we met the same bellman and asked him if the marina restaurant was open. We weren't sure it would be since it had started to rain and was quite windy. He took us to the restaurant via a golf cart. We had a lovely meal at the marina restaurant and then walked along the pier back to the hotel. There are several yachts docked in the marina that are for sale. The prices ranged from several hundred thousands to millions. This is an excellent location for anyone departing on a cruise from the Ft. Lauderdale cruise port. You can see your ship come in from your balcony window (if you ask for a tower room facing the pier). It is a short cab ride from the hotel to the pier. We will be writing more about our conference cruise in future articles. The Allure of the Seas is an amazing ship with so much to offer, especially for families. Each time we are on her, we see something new since you can't experience everything on one cruise. We are monitoring a second storm which has formed southwest of Manzanillo, Mexico. Tropical Storm Jova may become a hurricane by Saturday and is expected to make landfall. THE EAST OR EAST-NORTHEAST IS EXPECTED TONIGHT AND SUNDAY. We are monitoring a new storm which has formed off the southern tip of Baja California. Tropical Depression Eleven-E is forecast to become Tropical Storm Irwin Thursday night and a hurricane by Friday. You've decided to go to your local hotel for a weekend getaway and you call reservations to book your room. What are some of the questions the clerk asks? How many people? Do you want a king bed or two double beds? Do you want high floor or low floor? Is anyone in your party handicapped? Do you want to be near or away from the elevator? Would you like the parking lot view or the pool view? Just as hotel rooms aren't alike, neither are cruise ship cabins. You'll need to decide on the types of accommodations that will best meet you and your traveling companions' needs. Pictured above is your typical Interior (inside) cabin. As you might expect, it has no windows of any type. Imagine walking into a bedroom or walk-in closet that doesn't have any windows. That's exactly what you should expect in an inside cabin. These will be the lowest priced cabins on the ship. If you like dark when you sleep, then this is definitely for you. On the other hand, if you are claustrophobic, then you definitely won't want this type of cabin. Just like in a hotel, not only does the type of cabin factor into the cost, but also the location. Cabin types are further divided into categories. Each cruise line has a different labeling scheme for categories, but what they have in common is grouping by deck and location on the deck. The least expensive inside cabins will be found on the lowest decks, either all the way forward or all the way aft. 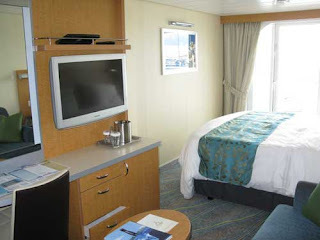 Cabins located in the center of the deck command a premium price as do cabins located on higher decks. The next category of cabins is the Outside accommodations. As the name suggests, these cabins aren't hidden away in some dark interior part of the ship, but rather have some sort of window that allows you to look out at the sea. On the majority of the ships, the cabin may have a port hole or picture window. These cabins tend to be on lower decks and could be across the hallway from an interior accommodation. For families traveling with children, you may want to book an inside for the kids and an outside for parents. We'll leave cabin size to another blog post by the way. Location is still a price-determining factor as was the case with the inside cabins. Another sub-category is outside cabins that have an obstructed or partially obstructed view. The picture above shows a cabin that is partially obstructed. You can look out at the sea, but you'll also see a life-boat or other obstruction due to the location of the cabin. You have a view with any of these cabins, but you won't get any fresh air since the windows do not open. Balcony accommodations, like the cabin pictured here, are the next major level up from Outside cabins. As the name implies, you have a private veranda (balcony) which is accessed via a sliding door in your cabin. 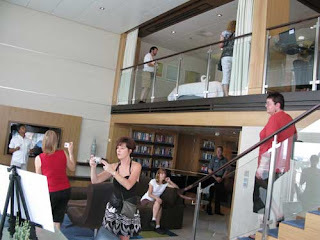 Most balconies have a small table and one or more chairs so that you can lounge outside your cabin and watch the sea go by or view the port as the ship arrives or sails away. 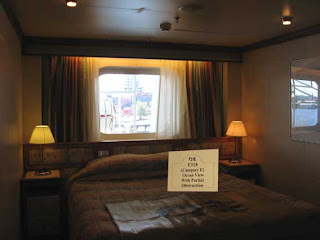 These cabins are primarily on the higher decks, although on some modern ships, there is a high percentage of balconies, which implies they could be found on lower decks. Location is still important with balcony accommodations. On some ships, there are balconies located on the "hump", or area of the ship that juts out further than the rest of the cabins on that deck. These are typically in the center of the deck and command a premium price. Royal Caribbean's newest ships, Oasis of the Seas and the Allure of the Seas have interior balconies that overlook Boardwalk and Central Park neighborhoods, but all other ships provide a view of the ocean from your balcony. Deluxe accommodations come in various shapes and sizes and offer exclusive amenities to guests. These cabins are also known as balcony suites on most cruise ships. These deluxe accommodations are comparable to suites one would find in finer hotels on land. 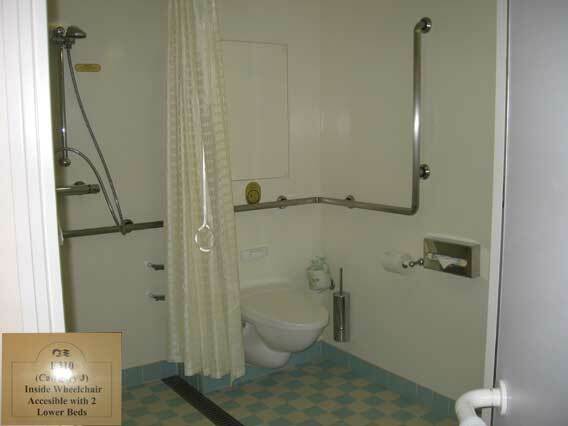 The cabins may have butler service depending on the cruise line. They are larger than standard balcony cabins in most cases and may even have multiple bedrooms to accommodate families or groups traveling together. Pictured here is one of the Royal Loft Suites with Balcony on the Oasis of the Seas. This is a two-deck high stateroom with panoramic views. Besides the multiple sleeping areas, the private balcony comes complete with whirlpool and dining area. You may not want to leave your suite at all during the cruise. We mentioned we'd talk about cabin size another time, but just to give you an idea, this is larger than some houses. Most ships have specially designed cabins for guests that have accessibility needs, such as wheelchair access. These may be limited in quantity and cabin types, so you'll need to book early if this is a necessity for your cruise. 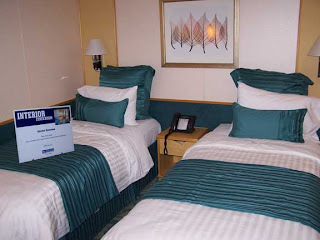 There are many types of bed configurations on ships. The standard sleeping arrangement is two twin beds that can be together or apart. Bunk beds, sleeper sofas, Pullmans, roll-a-ways, and even cribs can be found on most ships. You'll want to be sure to discuss options with your cruise specialist. Cabins are double occupancy for the basic configuration. There are a limited number of cabins on most ships that can handle 3 or 4 guests. If you have more than that in you party, you'll need multiple cabins or one of the deluxe accommodations. Triple and quad-occupancy cabins are strictly controlled by the U.S. Coast Guard. Once capacity is reached, the cruise line cannot sell any additional cabins of that type. So, book early if you will have more than double occupancy in your party. Do you think you have this all figured out? You know exactly what cabin type and category you want for your cruise? Let me warn you. We've over-simplified things here. 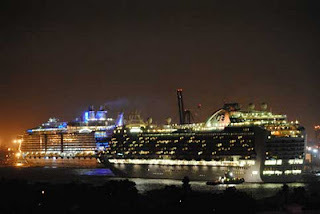 There are 37+ different categories of cabin accommodations on Royal Caribbean Oasis of the Seas and Allure of the Seas. That is the most extreme case at the present, but the majority of the ships have more than 10 different types of accommodations with multiple categories within type. Many times we've had prospective customers ask about a particular rate they saw on some advertisement. They can't understand why the price we're quoting is higher than what they found. Probably the funniest story was a conversation with a honeymoon couple that saw a cabin with a lower price than we were quoting. When asked if they really wanted to spend their honeymoon in bunk beds, they saw the error of their ways. It is best to work with a cruise specialist who can properly advise you about the various pros and cons of each cabin category. The last thing you want is to be sea sick because you picked a cabin location where you felt every wave during your cruise. Or perhaps worse yet, you got no sleep the entire cruise because you were right next door to the main elevator. There are reasons why the cabin is priced lower than others. We have deck plans for all the ships on our website. Just select the cruise line you are interested in and browse the ship's photos, 360 views, and layouts. Here are some links to photo albums on our FB page. If you've ever thought about going on your first cruise, October is the time to begin that journey. There are so many different ships to chose from - which one is right for you? 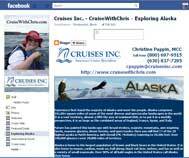 One way to find out is to review Cruise Line Videos on our NCVW microsite. There you will see videos from Royal Caribbean International, Carnival Cruises, Celebrity Cruises, Holland American Line, Norwegian Cruise Line, Princess Cruises, and Azamara Club Cruises. These videos will show you the cruise experience onboard their ships and may also mention special incentives during NCVW. After you view the videos, you may also which to take a closer look at one or more ships. Enjoy panoramic 360-degree views of cabins, dining rooms, casinos, pool decks and more on our Virtual Ship Tour page. These full-featured tours have a special programming language, which eliminates the need for downloading special software. Finally, there are videos and photo albums on our Facebook Fan Page. If you've ever thought about going on your first cruise, October is the time to begin that journey. 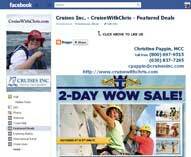 Our Facebook Fan Page is a great resource to help you get started on your cruise planning. If you "like" us, you won't miss any special announcements or new material postings. This is the landing page when you first connect to our Facebook Fan page. On this page you can learn more about us and how we got started cruising and later turned our love for cruising into a business. We have links to this blog and also to our website. You can click on the images or links to sign up for our weekly eNewletter, watch our featured video, explore the Cruise Help, or learn about our featured deals and destinations. The popular "Where is Chris" link is your key to those destinations. Once you become fans, your Facebook news feed will include updates that we make to our pages. We frequently make updates which include photo albums, news stories, and information about special events and offers. You may want to scroll through some of the older posts to see if there is something of interest to you. We love hearing from our fans, so if you have questions or want to share something with our fans, please do so. On our Welcome page, we feature one special cruise or land vacation deal and link to our Featured Deals page which has additional offers. That's right folks, we specialize in cruises, but for those trips where you want to do something different, like an all inclusive, we can offer our advice on that also. 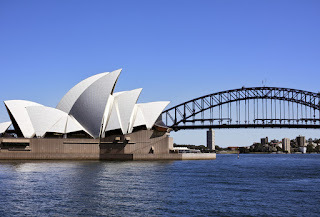 Click on one of the following to explore some cruise destinations and cruise ships. If you've ever thought about going on your first cruise, October is the time to begin that journey. We suggest you also read our article Cruise Rookies to get started. 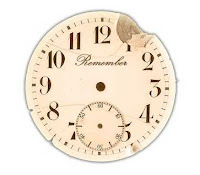 Remember when you were a baby and you found something on the floor? What's the first thing you'd do? Most likely, you put it in your mouth to see what it was. You compared the newly found object with others that you had already experienced. To start planning a cruise vacation, there are three basic questions you'll need to answer. The answers to those first questions will narrow the list of remaining choices that you'll need to make. You can draw upon past experiences in your life to answer them. There are cruises year-round, but some destinations have specific cruise seasons, like Alaska for example which goes from May through September. The more flexible you are on when you want to go, the more choices you'll have to select from. Also if cost is a factor, the time of year you travel will play a significant role in what you pay. Assuming that the time you selected has several cruises that match your criteria, you'll next want to decide what you'd like to see. Since this is your first cruise, the sky is the limit - everything is going to be new to you. After you have been cruising awhile, you'll want to try different destinations. There are 23 ports in the United States that offer cruises ranging from 3 nights up to World Cruises which are over 100 nights in length. If you have restrictions on where you want to depart from, that will limit the ports of call that you could potentially visit. If you've ever made hotel reservations, it won't come as a shock to you that the next question you'll be asked is what type of cabin you would like. inside cabins (like your bedroom with no window), outside (again like your bedroom, but now you have a port hole or picture window), and balcony (it includes a private veranda with a sliding door). There are additional classifications of cabins, but we don't need to get into that at this time. Location (forward / aft / mid-ship and deck) factors into the cost of the cabin. If you think that the motion of the ship might make you uncomfortable, you'll want to have a cabin mid-ship. As you can see, booking a cruise vacation is very similar to booking a hotel room. You decide when you want the reservation, which hotel location, and what type of room. Your hotel could either face the parking lot or the ocean with the latter costing more than the former. For more cruise resources, be sure to bookmark the following blog post, where we'll be adding additional links throughout the entire month. It is best to discuss your cruise plans, especially for your first cruise, with a professional cruise specialist. They can assist you by asking all the right questions to narrow down your selection to the cruise that is right for you. We love working with first time cruisers since we are able to draw upon our experience and expertise to get them started on, what we hope will be, a lifetime of cruise vacations.